This is an event – the first resource to be posted borne of collaboration! 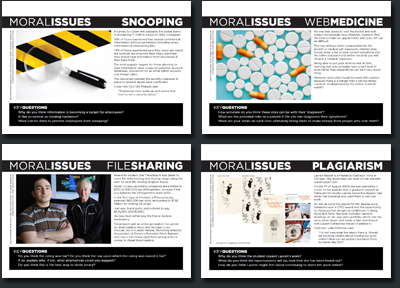 Debbie Jones – @teach_ict – of Teach-ICT fame very kindly put together two of the handouts in this set covering the moral issues in ICT. I hope they’re useful – we had fun making them! Thanks for these resources, they are excellent! I think they would provide excellent discussion activities. I also like your resource showing the young web millionnaires. I too find that students find it too easy to dismiss ICT’s usefulness and value in today’s society. I am working on a few generic classroom displays such as “Use of ICT in Society” and will let you have a copy once they are complete. Thanks Adrian, glad you’ve found them useful! Thanks for sharing these resources – they are excellent and should provoke a good deal of thought and discussion! I reall appreciated your work on this. Thanks.